Concentrating solar thermal power tower plants with capacities of 100 MWe or greater require large heliostat fields with heliostats over 1,500 m (nearly a mile) away from the tower. The accuracy and performance of these heliostats must be evaluated and understood as new heliostat designs emerge to reduce costs. Conventional beam characterization systems that use photographs of the reflected beam on a tower-mounted target are typically not large enough to capture the beam at large distances, and the magnitude of the irradiance for long-distance heliostats is quite low (only a fraction of a sun), which can make the beam image difficult to discern from the ambient lighting on the target. The Long-Range Heliostat Target (LRHT) is a vertical array of collimated pyranometers deployed to a test site via flat-bed trailer and quickly erected on an aluminum truss tower. Once the sensors have been aimed at the heliostat, the heliostat beam is swept azimuthally across the array whereupon the data is stitched into a flux map indicating horizontal and vertical beam dimensions and flux intensities. The LRHT was used to evaluate beam shape, peak flux, canting adjustment, and total power of heliostats and single facet reflectors at distances from 300-1700 meters. 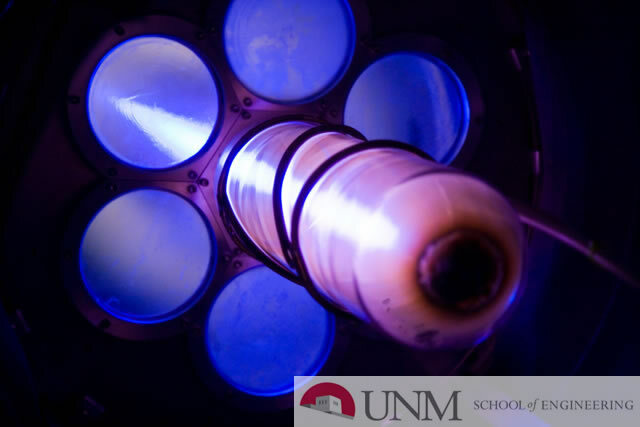 Results were compared to theoretically rendered flux maps created by computational ray tracing algorithms, and to IR-filtered, visual-band-filtered and non-filtered photographs taken on the beam characterization system (BCS) at the National Solar Thermal Test Facility at Sandia National Laboratories.